Today a Tableau maintenance release (update: 7.0.5) is available that is anything but mundane. The latest release includes several new capabilities, from High Availability to a direct connection to SAP® Business Information Warehouse (SAP BW). It's like a bunch of fresh cut flowers in the form of bits & bytes. So what's in the air today? Enterprise Resource Planning (ERP) systems contain some of an enterprise's most valuable data. SAP Business Warehouse (BW) is a widely used data warehousing solution for SAP customers to integrate data from SAP applications. Tableau is releasing a native connector to SAP BW which enables organizations to deliver interactive analysis to any user. This connector works through the ODBO layer (also known as MDX) and takes full advantage of the metadata and security stored in BW. This connector will give SAP and Tableau customers tremendous insight into their business data and let them get more value from their SAP systems. For more on the business value you can get from connecting business intelligence and data discovery to your SAP system, see this new report by Aberdeen Research. Or watch a video on connecting to SAP BW on our SAP solution page. Business Intelligence is a mission critical application. In many enterprises it’s important for the BI system to be available 24/7 and to be able to recover from errors with no need for human intervention. Tableau Server has the capability to automatically failover in the event of a failure. This is accomplished by replicating critical components such as the Data Engine and the Repository. For more on Tableau's High Availability capabilities, read this new whitepaper. Tableau 7 brought multi-tenancy to our customers who wanted to create walled gardens for different departments or customers. Now we've added the ability for a content administrator to manage their own users in a multi-tenant site. Also, a site can now have a user quota. This lets the system administrator focus on system tasks while giving content administrator control over all local administration. 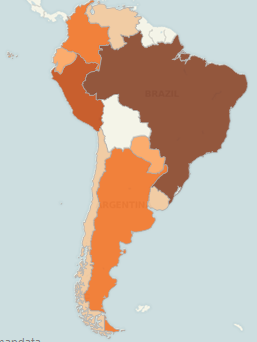 And finally, Tableau is delivering on its promise of "Analytics everywhere" with localized versions of Tableau Desktop and Tableau Server in Spanish and Brazilian Portuguese. Someone working in his or her native language will naturally have a much more fluid and faster thought process, speeding up the cycle of visualization and providing better results in less time. This release follows our delivery of French and German versions of Tableau and our support of many locales for number and date formats, and will be followed by other localized versions. You'll see us release other features prior to our next major release, including support for Android tablets and a few other small surprises. SAP® Business Information Warehouse (SAP BW) is the trademark(s) or registered trademark(s) of SAP AG in Germany and in several other countries.